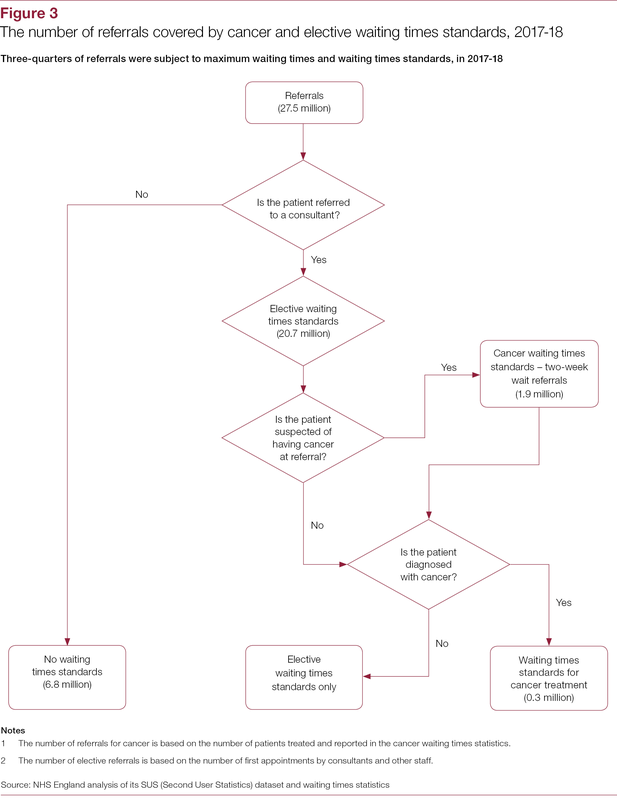 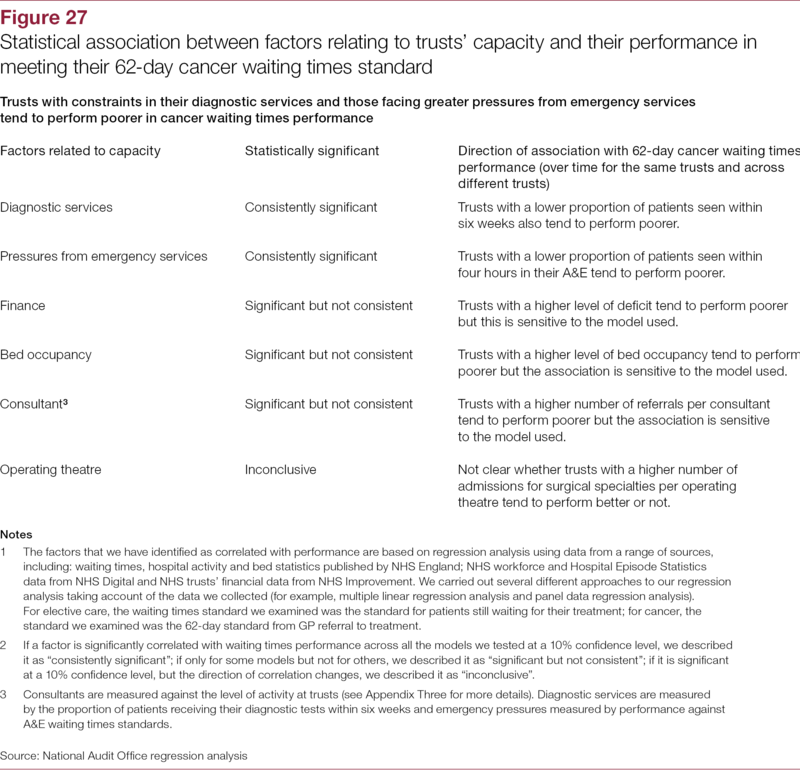 This report examines waiting time standards for elective and cancer treatment and factors associated with performance in meeting these standards. 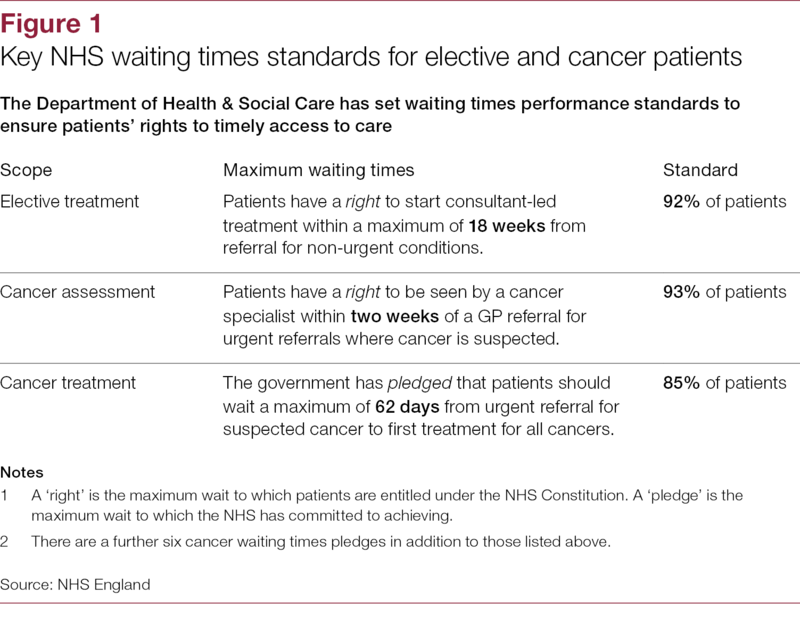 Under the NHS Constitution, NHS patients have the right to receive consultant-led elective (non-urgent) treatment within 18 weeks of being referred for treatment (usually by a GP), unless they choose to wait longer, or it is clinically appropriate to do so. 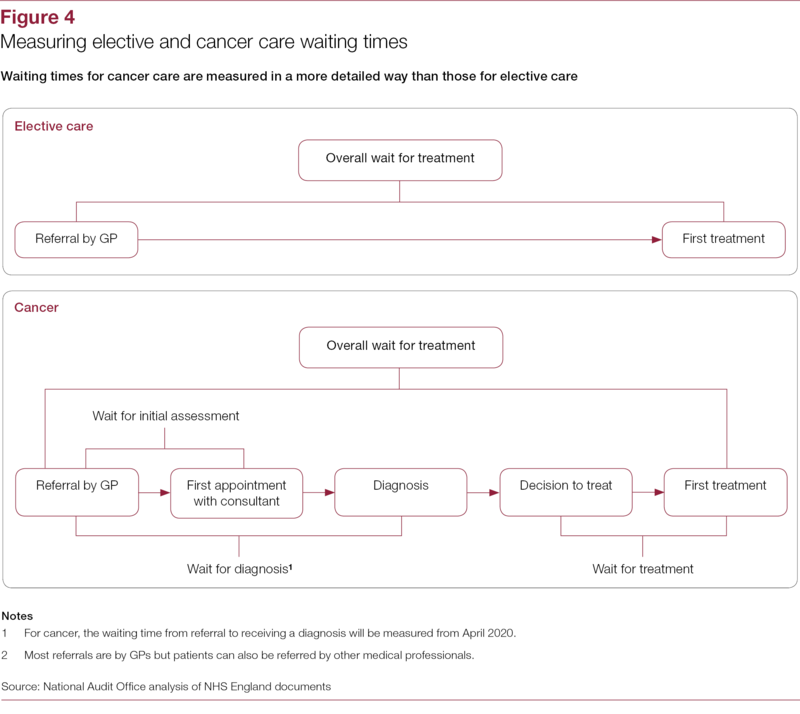 For urgent referrals for suspected cancer, patients have the right to be seen by a cancer specialist within two weeks. 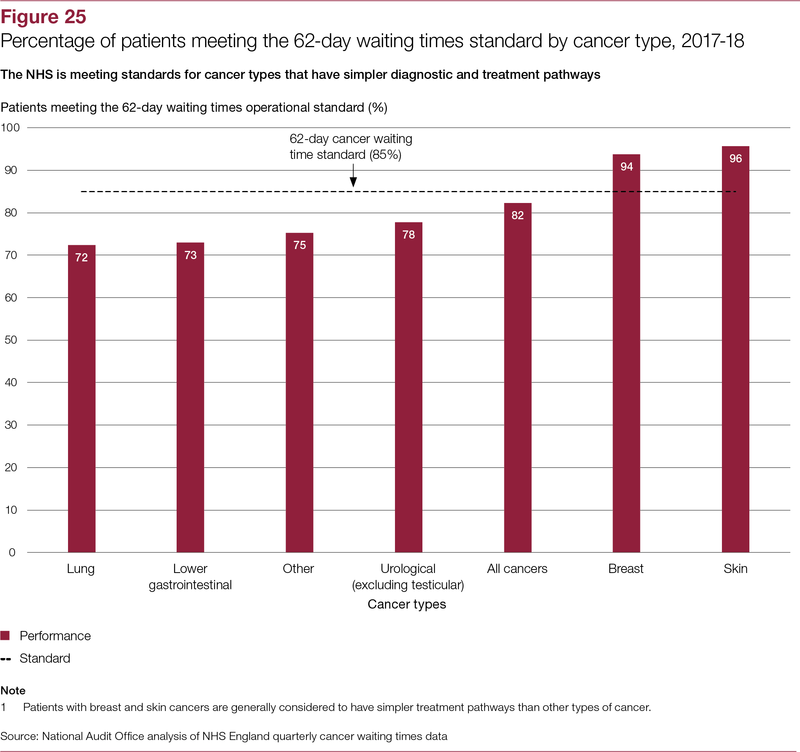 The government has pledged that patients should wait a maximum of 62 days from urgent referral for suspected cancer to first treatment for all cancers. 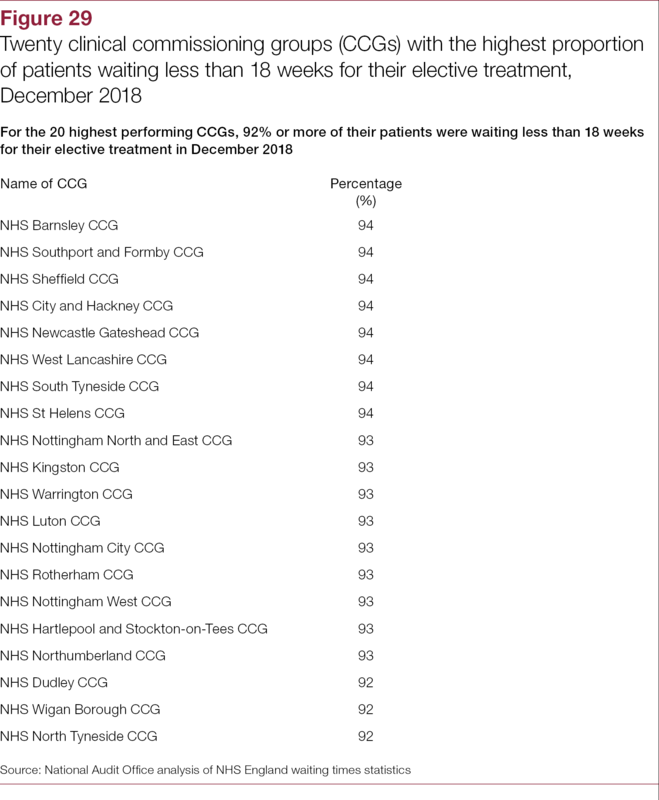 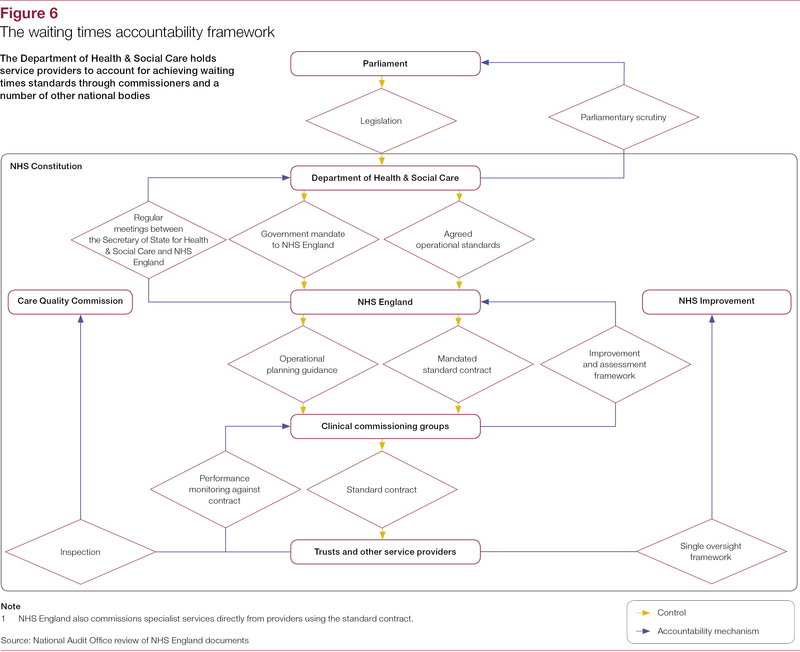 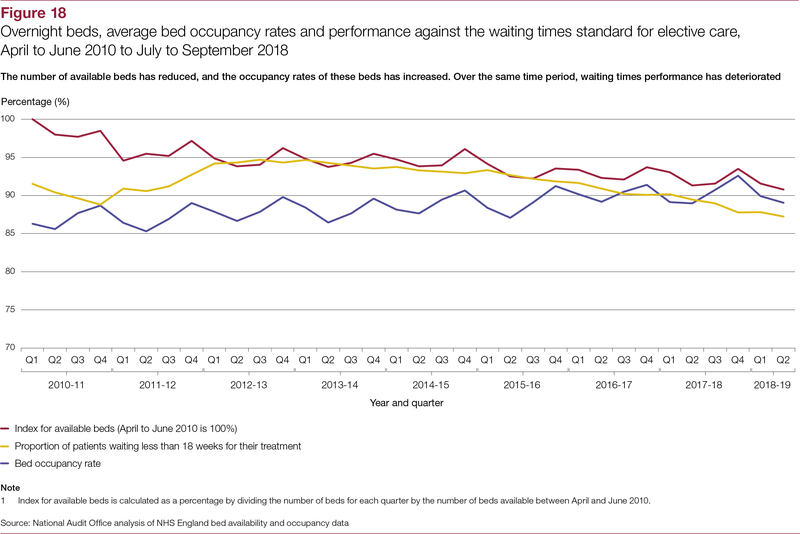 To ensure patients’ rights to timely access to care, the Department of Health & Social Care has set various waiting times performance standards. 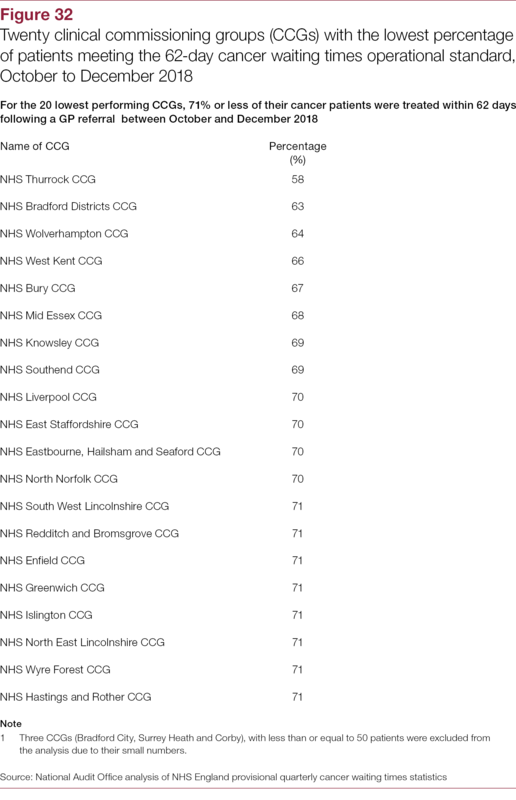 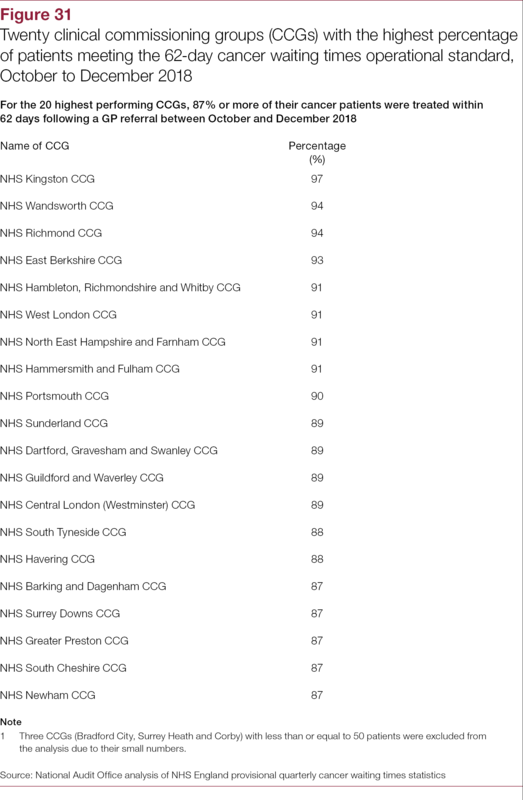 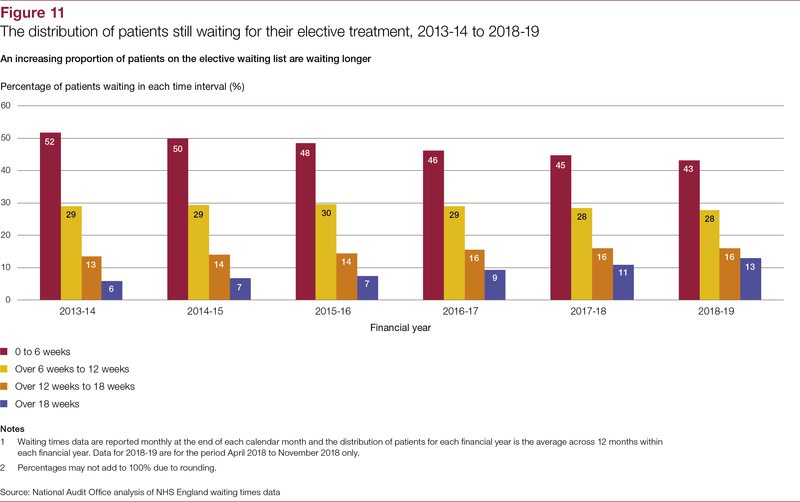 These describe the percentage of patients that NHS bodies must treat within maximum waiting times. 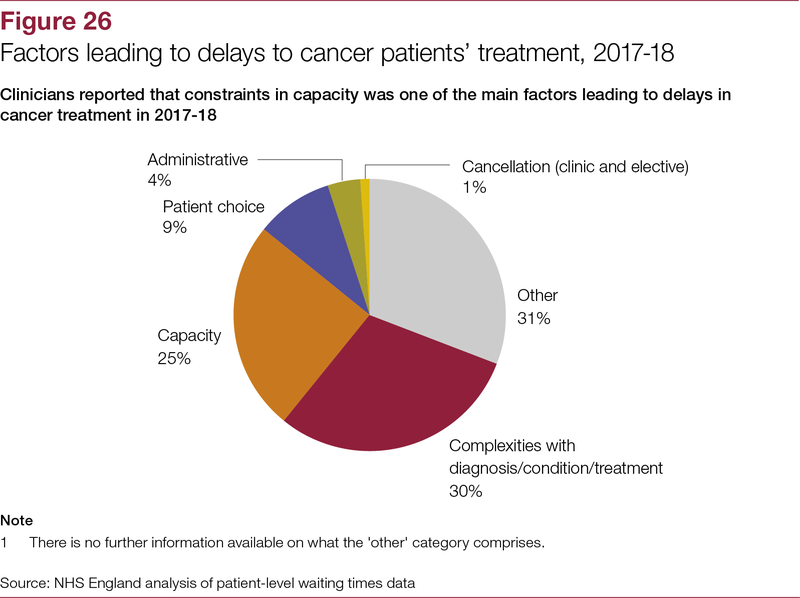 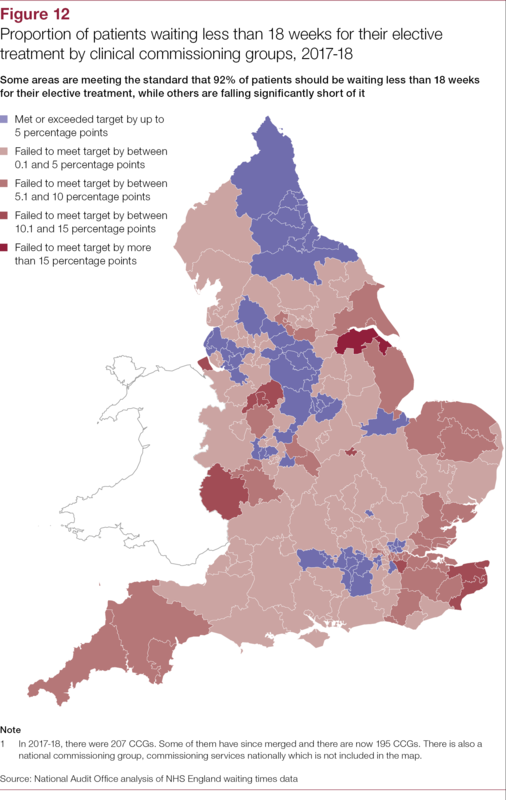 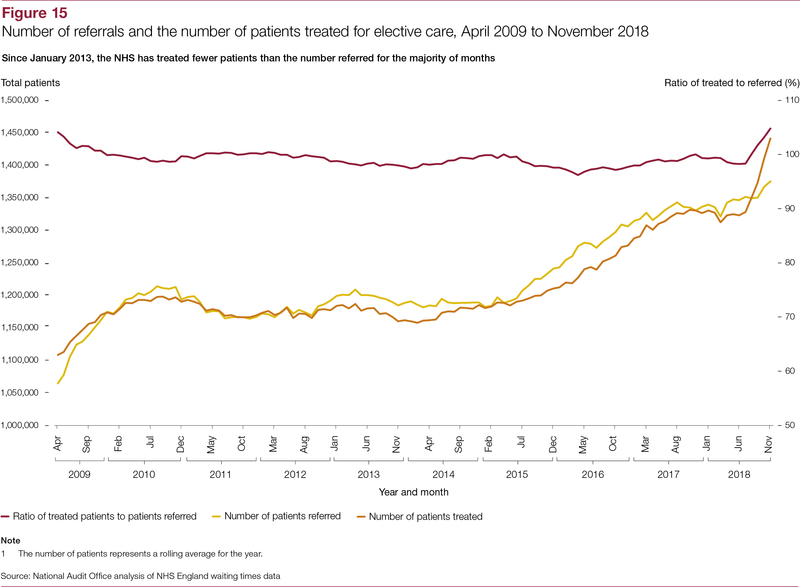 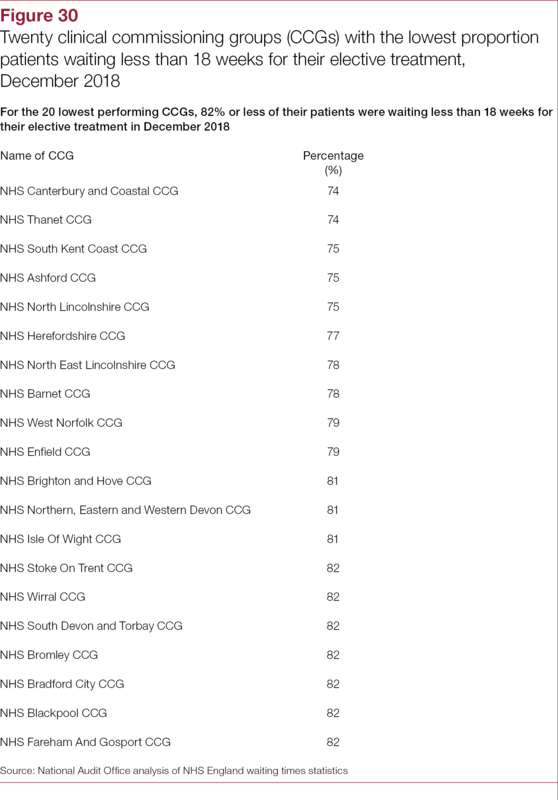 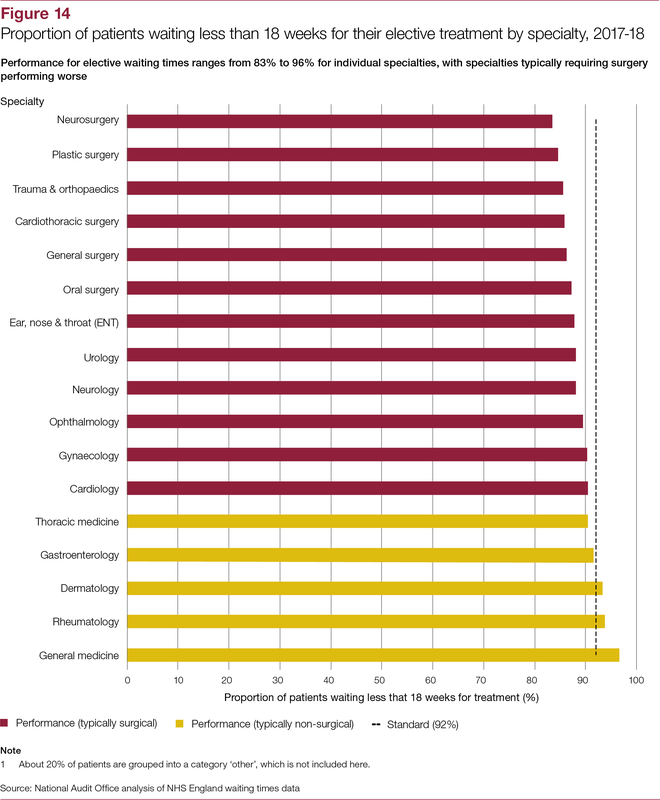 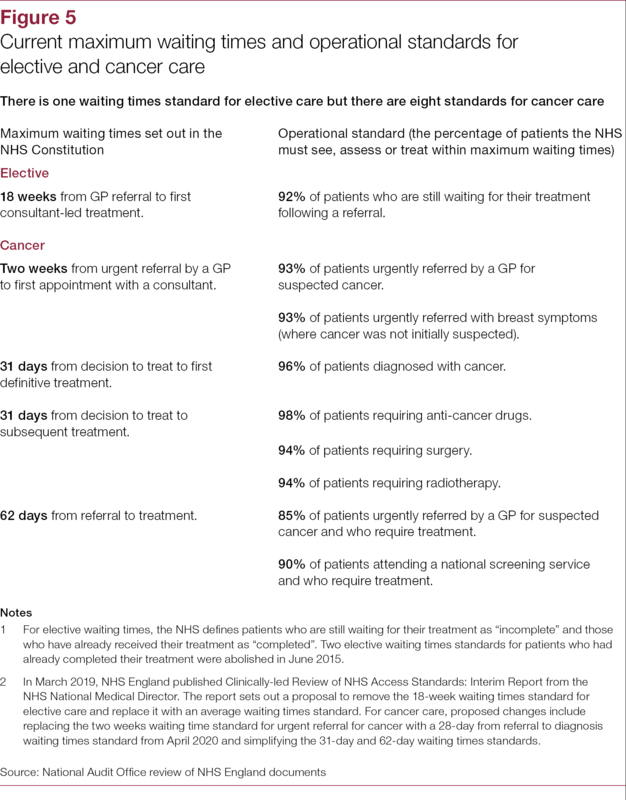 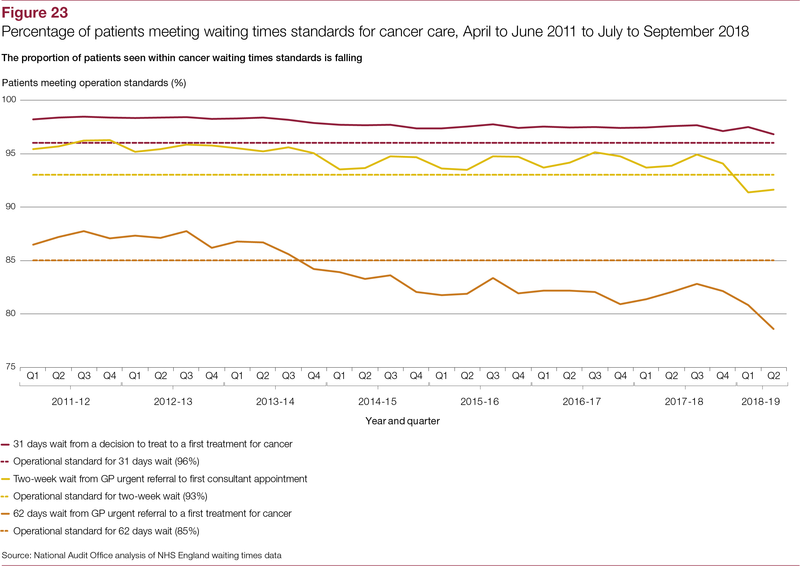 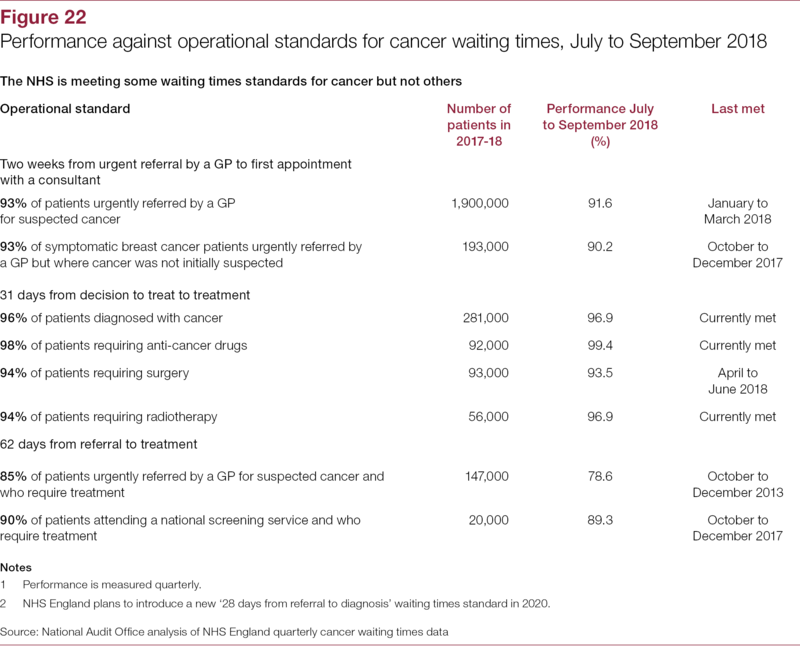 Three-quarters of outpatient referrals, as well as many admissions to hospital, are covered by waiting times standards for non-urgent (elective) and cancer care. 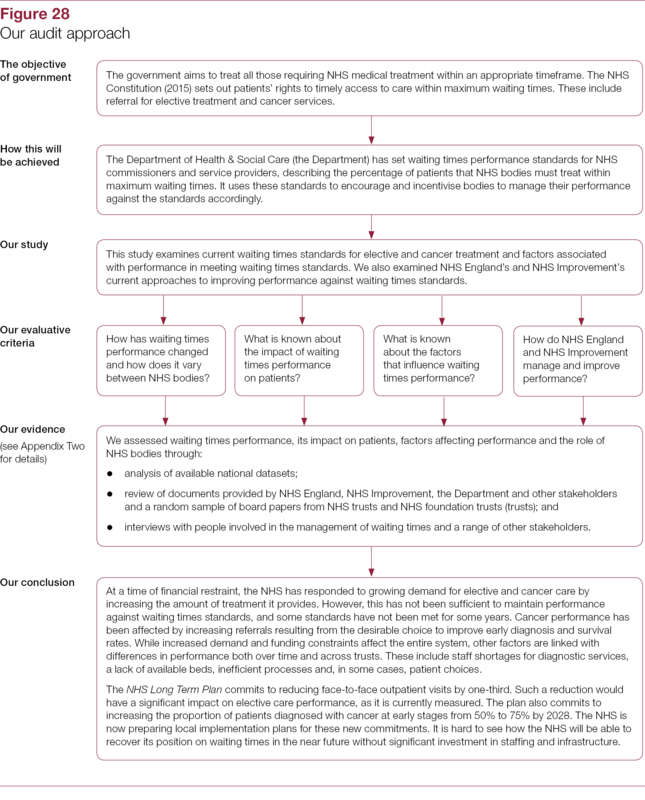 NHS England’s and NHS Improvement’s approach to managing and improving waiting times performance. 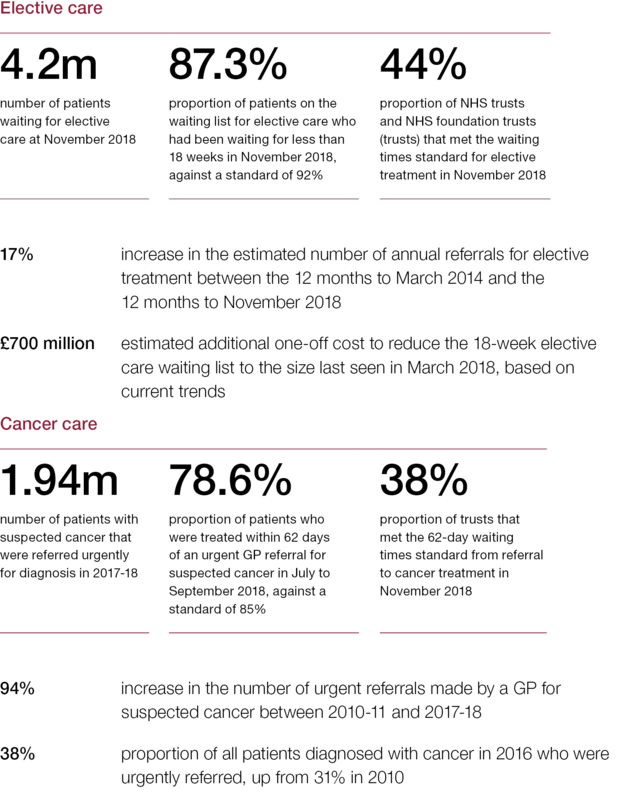 At a time of financial restraint, the NHS has responded to growing demand for elective and cancer care by increasing the amount of treatment it provides. 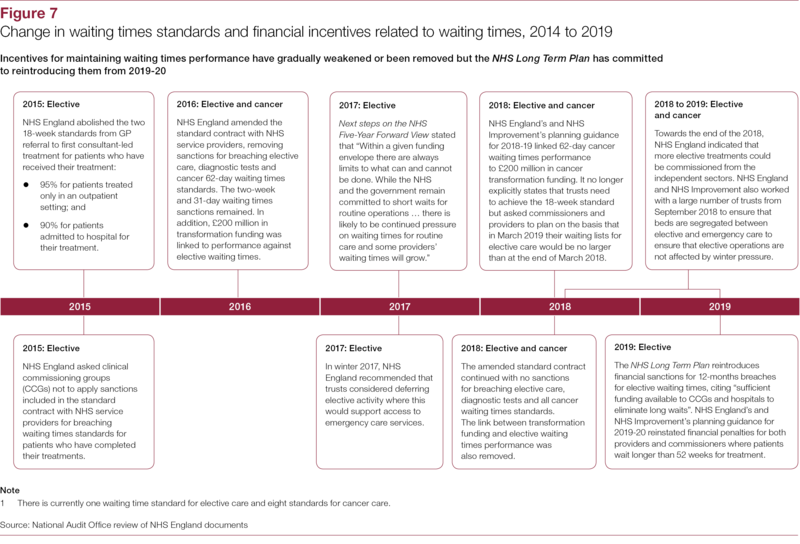 However, this has not been sufficient to maintain performance against waiting times standards, and some standards have not been met for some years. 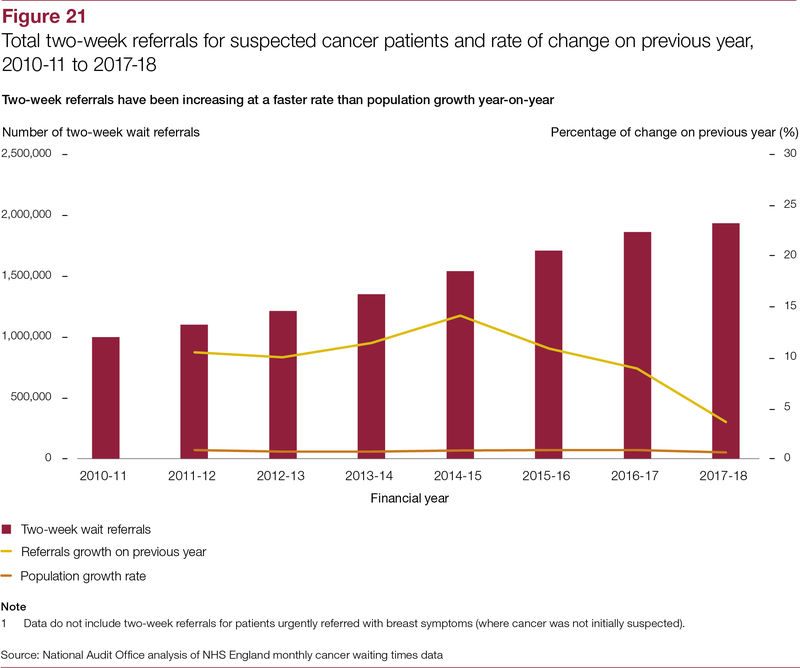 Cancer performance has been affected by increasing referrals resulting from the desirable choice to improve early diagnosis and survival rates. 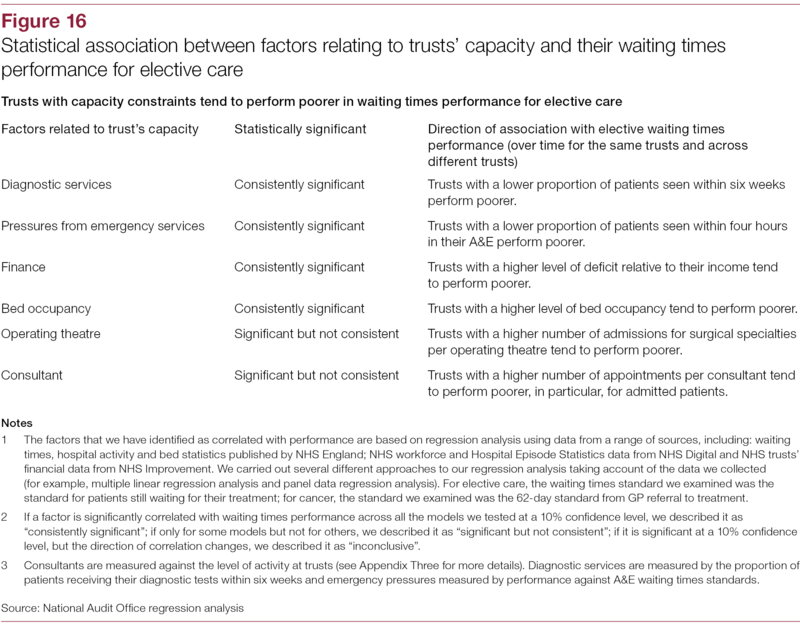 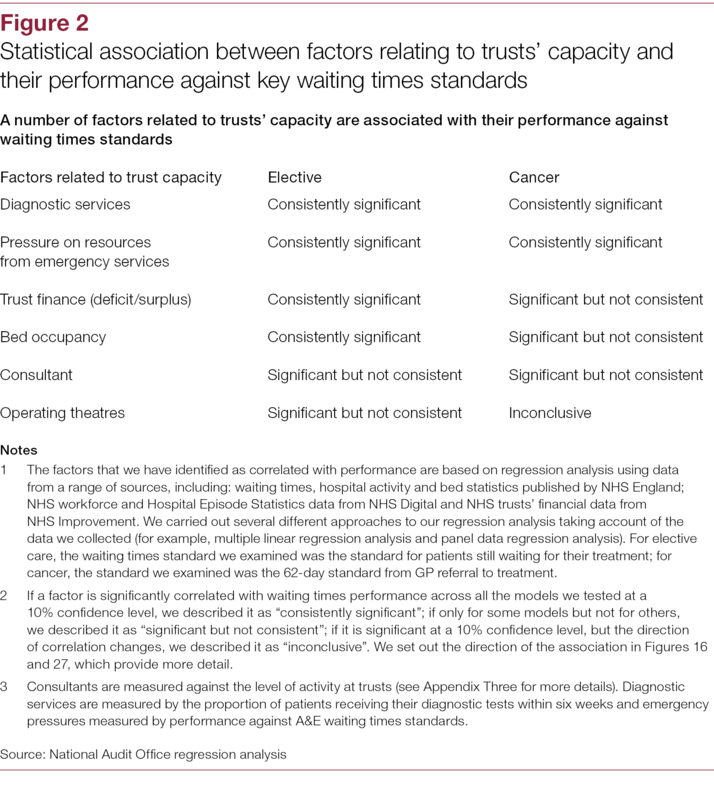 While increased demand and funding constraints affect the entire system, other factors are linked with differences in performance both over time and across trusts. 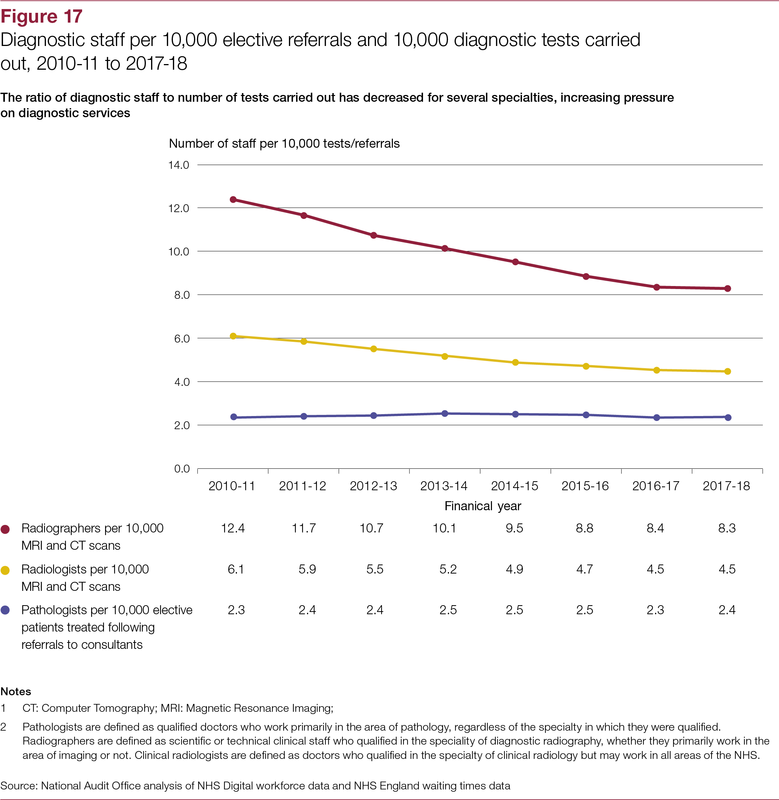 These include staff shortages for diagnostic services, a lack of available beds, inefficient processes and, in some cases, patient choices. 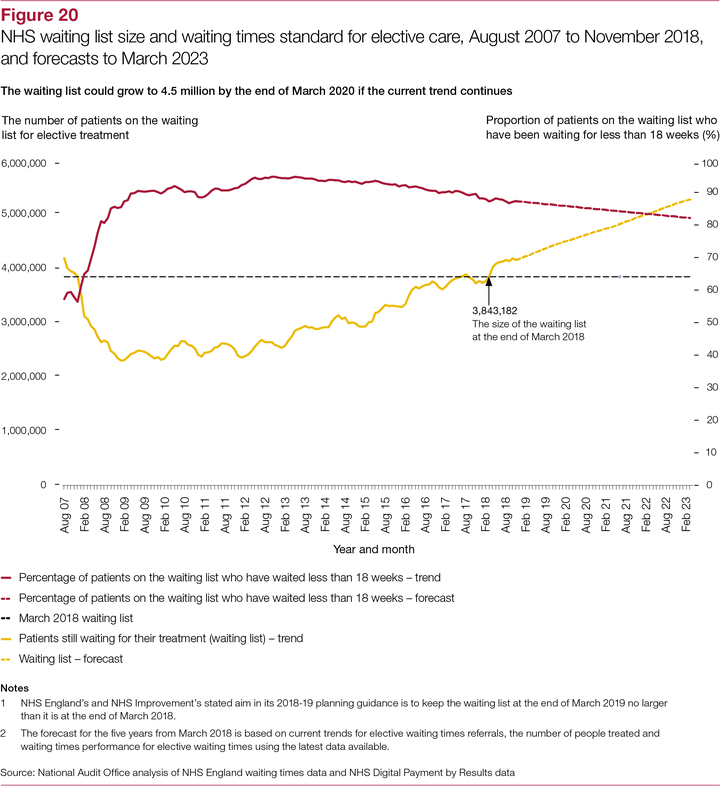 The NHS Long Term Plan commits to reducing face-to-face outpatient visits by one-third. 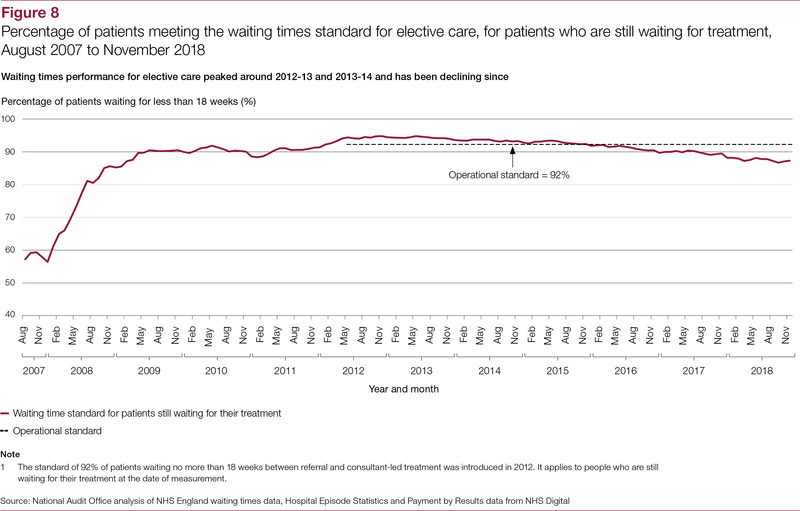 Such a reduction would have a significant impact on elective care performance, as it is currently measured. 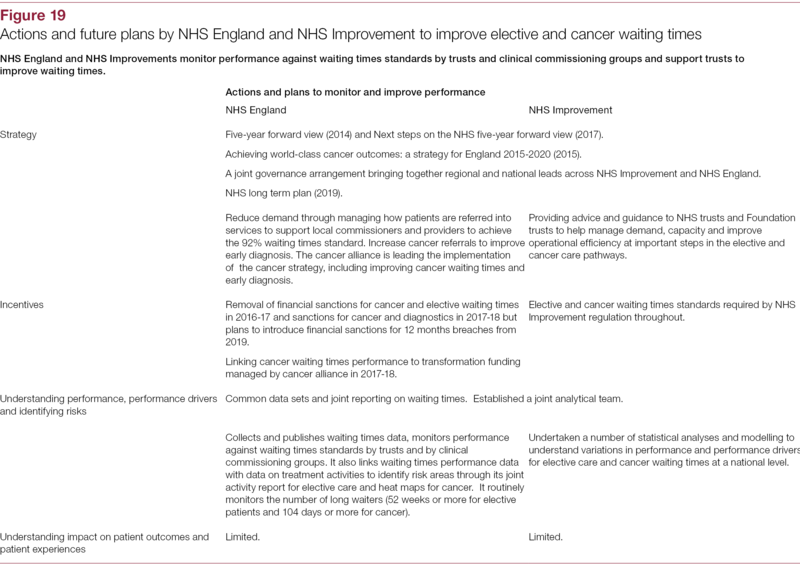 The plan also commits to increasing the proportion of patients diagnosed with cancer at early stages from 50% to 75% by 2028. 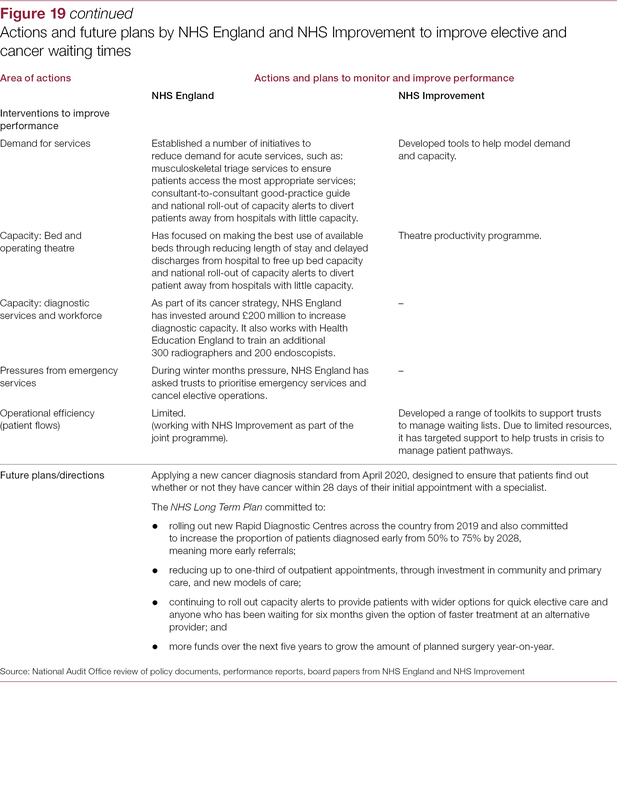 The NHS is now preparing local implementation plans for these new commitments. 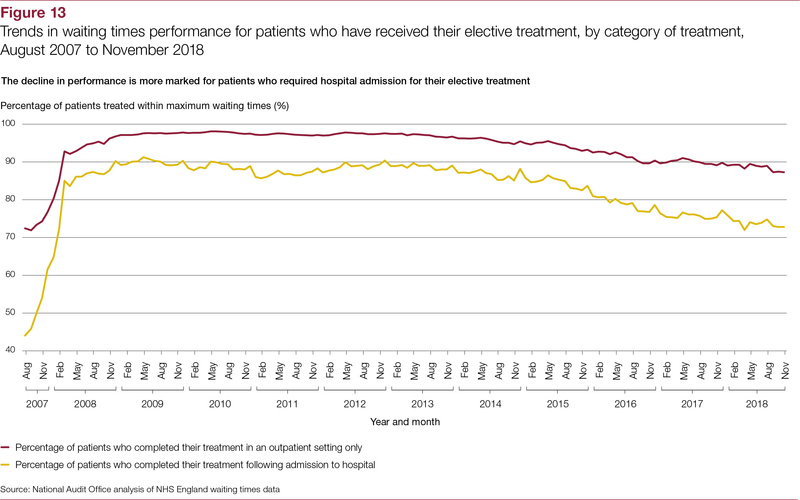 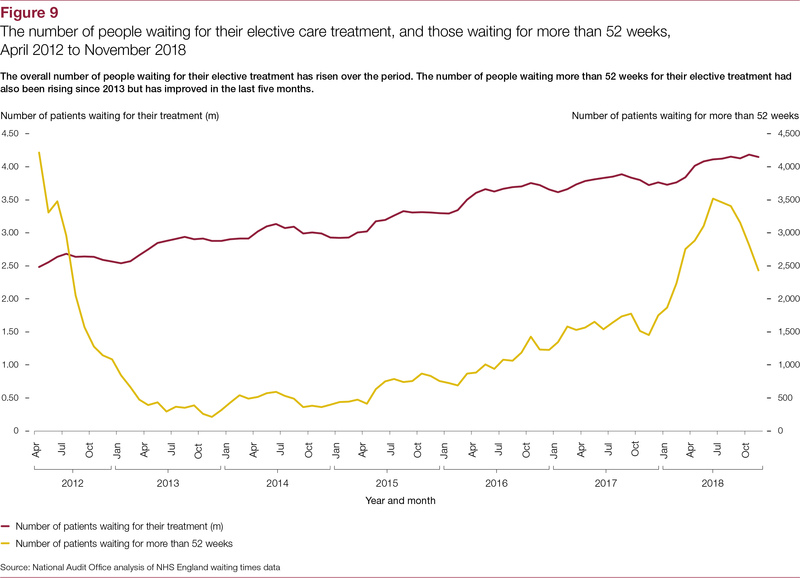 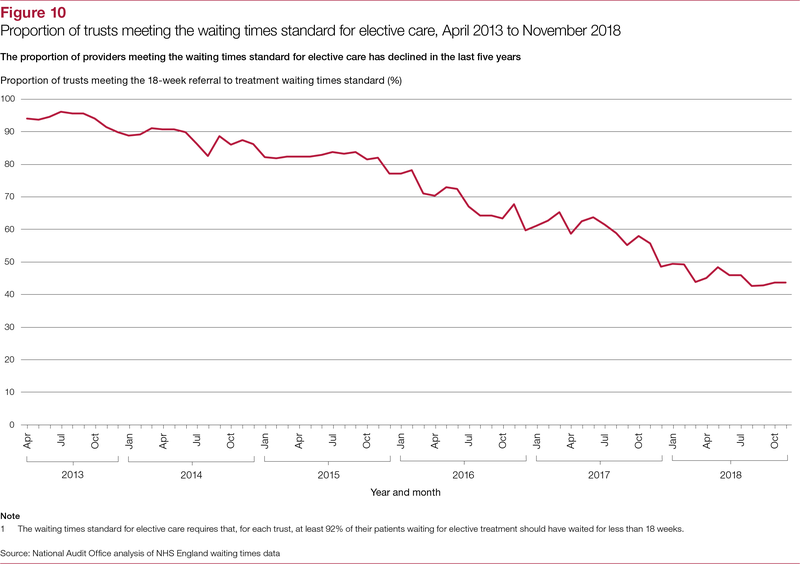 It is hard to see how the NHS will be able to recover its position on waiting times in the near future without significant investment in staffing and infrastructure.